The Turkish Republic was formed out of immense bloodshed and carnage. During the decade leading up to the end of the Ottoman Empire and the ascendancy of Mustafa Kemal Ataturk, virtually every town and village throughout Anatolia was wracked by intercommunal violence. 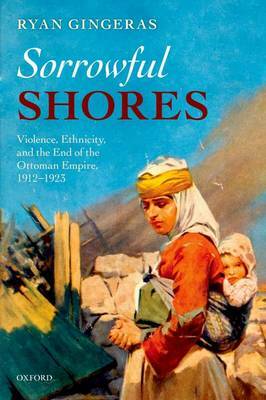 Sorrowful Shores presents a unique, on-the-ground history of these bloody years of social and political transformation. Challenging the determinism associated with nationalist interpretations of Turkish history between 1912 and 1923, Ryan Gingeras delves deeper into this period of transition between empire and nation-state. Looking closely at a corner of territory immediately south of the old Ottoman capital of Istanbul, he traces the evolution of various communities of native Christians and immigrant Muslims against the backdrop of the Balkan Wars, the First World War, the Armenian Genocide, the Turkish War of Independence, and the Greek occupation of the region. Drawing on new sources from the Ottoman archives, Gingeras demonstrates how violence was organised at the local level. Arguing against the prevailing view of the conflict as a war between monolithic ethnic groups driven by fanaticism and ancient hatreds, he reveals instead the culpability of several competing states in fanning successive waves of bloodshed.